If you read last Saturday's New York Times article about Mike Hart, you might have learned something about the 5' 9" running back who has set the career rushing record at Michigan earlier this year. So much, this young man means to the not only the football team he plays for, but the University he attends. All of us Michigan fans need to cherish the next 3 games of this season. Cherish the fact that we still get to watch Mike Hart play for us. 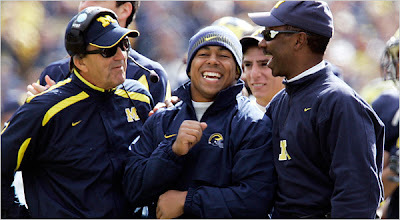 He's maybe the most special player to ever wear the maize and blue uniform. For me, his legacy was cemented this season with his dignity and character. Its both a shame and a blessing that he's not going to be considered for the Heisman trophy. Its a shame because I wish every fan could see what a special person he is...but a blessing because thats not Mike's style. Mike Hart would feel more comfortable feeding the homeless and raising money on campus for the victims of the shootings at Virginia Tech than sitting at the Heisman presentation in a suit at the New York Downtown Athletic Club. Certain people are like that...Bo was like that. Great football guys are like that. Its not about single player awards...like Bo used to say, its about "The team! The team! The team!". For all the reaction about Hart's comments towards Michigan State after the game last weekend, I think a lot of critics jumped to conclusions. But look at it from Mike's perspective. Dantonio disrespected a proud Michigan team with his comments after the Appy State game. For the first year coach, he ought to consider this as his introduction to a long and bitter rivalry. You just don't say things like that about you instate opponent. Never. Um...actually it started long before you got here buddy. Welcome to the show. See you next year in the Big House.